This document describes all the different things you can define on the MAG, and what components need to be created first. Or at least what components link to other components. The diagram below graphicly reveiws the hiarachry. For example, if you want to define session timeouts, you will first need to create a User Role. The following list outlines the steps you need to take, and the links to show you how. User Role: Groups that are allowed access to resources like vpn tunneling, web links, or meetings. 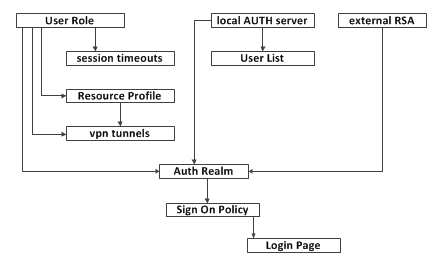 VPN Tunnels: The specific steps needed within user roles and resource profiles to get vpn tunneling working.